Don't know what gift to choose for your family or friends? 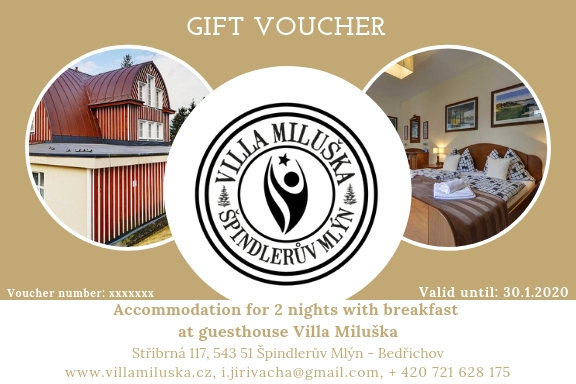 Delight your loved ones with a gift voucher for stay at Villa Miluška. Comfortable guesthouse right in the center of Spindleruv Mlyn offers its own cozy wellness center with sauna and relaxation zone. You can order your voucher at e-mail i.jirivacha@gmail.com, by phone at +420 602 852 775 or simply by using the form below. There is an error in the form. Please check the red marked items.